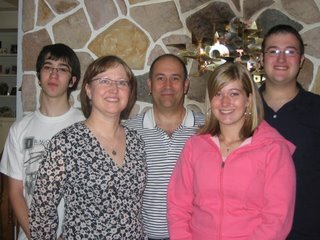 Sunday, October 8, 2006......... the Schweitzers enjoyed being together for Thanksgiving, and also a great meal at Grandma's. Now, as I write, I'm just recovering from my "last" chemo treatment.... I'm finding it a bit slow going, the fatigue and overall crumminess is lingering.... HOWEVER.... I will be on "vacation" from chemo for the next while. No way to know how long - that will depend on the scans. My oncologist hopes for stability and thinks it is reasonable to think that we might get 3-6 months with no disease progression. Or longer, or less.........cancer is unpredictable, as I know first hand! We'll see..........but it sure will be nice to have a break. My next appointment is November 1, and I will be having scans sometime in November/December to check out where things are at. I'm not sure if I know exactly what to do with my chemo vacation time, but I will be enjoying some 'normal' everyday life time, I'll be reading and watching "The View" and "Survivor" and "Amazing Race". I will be having the odd glass of red wine and plenty of dark chocolate. I'll be having coffee and visiting with my parents (down the street!). Gord and I are booked to go on a cruise (eastern Carribean) first week of December... and we are taking the kids to Phoenix in February. I'm planning to do more baking this holiday season, and looking forward to Christmas, when my brother and sister and families will be here.... all in all, very ordinary and wonderful times! It's great to see the photo. It's hard to guess how many family photos we have had taken in front of Mom and Dad's fireplace. I hope you enjoy your "rest". We are looking forward to seeing all of you at Christmas. Nice picture of you all. You look good despite everything Joanne. I hope this break stretches away to the horizon. I love the picture - you all look great! I am so glad that you are making the most of your break. I am also looking forward to enjoying all the Christmas baking! Can I put in an order?? How about some brown eyes?? Hi Joanne, you guys look great! It's nice to see everyone. How nice to be down the street from your mom and dad. Have fun with the baking and all the trips. If you have more TV time, try "The Office" it cracks me up. I can't wait til Christmas!!!!!!!!!!!!! !